Fresh from the farm. Thick & creamy. Easy to digest. 20% less sugar. Live cultures. Free from cows' milk. Made with British goats' milk. Gluten free. No artificial colours or flavours. Suitable for vegetarians. 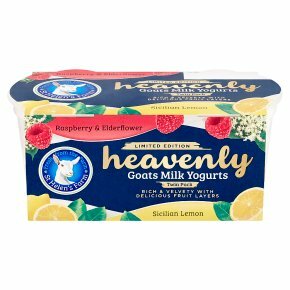 The goats' milk used to make this yogurt is 100% British and is from St Helen's Farm and other family farms in Yorkshire and the Midlands. Made with Live Cultures; Lactobacillus bulgaricus, Streptococcus thermophilus, Lactobacillus acidophilus and Bifidobacterium.